Powers/Abilities: George Prufrock had some experience in combat, including the use of knives and firearms. Lifeform is constantly mutating and becoming ever more powerful, though all forms are quite stinky. 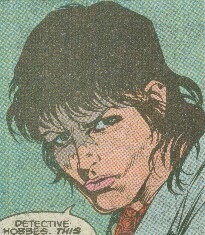 In his earliest form, he could be stunned by gunfire, but recovered rapidly; he was superhumanly strong (enhanced human), but also suffered hallucinations and flashbacks. After recovering from a rocket launcher assault, he developed dueling personalities, one a carnivorous/cannibalistic monster, the other more benevolent, trying to stop himself from killing and eating others. This form was even larger and more monstrous, and it ran around for a time without an arm after it was cut off by Jet. Tranquilizers served only to hasten its heart rates, and it dissolved after being pushed over the edge by tranquilizer overdose and multiple gunshots. After growing back, it was larger and stronger yet, able to trade blows with the Hulk. It was highly durable, though it seemed to perish when set on fire. Following a failed attempt to return him to human, the Lifeform became a monstrous, non-humanoid creature, with dozens or possibly even hundreds of tentacles, eyes and mouths. It could instantly regenerate from most injuries, and could survive on land, underwater, or even in the vacuum of space. It was immensely strong and durable, powerful enough to even challenge the Silver Surfer. However, it had no means of achieving flight. (Lifeform) Grew from Prufrock's height to a progressively larger humanoid (about 10-15' tall) before turning into a monstrous non-humanoid form that grew to perhaps 25-50' in diameter. (Lifeform) Grew from Prufrock's form to a monstrous creature weighing tons. (Incredible Hulk II Annual#16 (fb)) - George Prufrock was born into an extremely wealthy family with high ideals. He was idolized by his sister and adored by his father, and they were trained by the finest tutors under the watchful eye of his father, who attempted to prepare them for lives of influence and power, like his. George and Martha were trained in all walks of life, though the chauvinistic Jethro did not allow Martha to work with his guns. (Punisher I Annual#3 (fb) - BTS) - Dr. Wertham (psychologist?, psychiatrist?) said George needed focus. (Incredible Hulk II Annual#16 (fb) - BTS) - George Prufrock attended college, majoring in theater arts and minoring in poetry. He intended to be a stage actor. (Incredible Hulk II Annual#16 (fb) - BTS) - Jethro Prufrock instead told George he would become a scientist, and George dutifully obeyed. (Incredible Hulk II Annual#16 (fb) - BTS) - Jethro got George a job working for AIM, and George worked hard for them. (Incredible Hulk II Annual#16 (fb) - BTS) - George's girlfriend Rita loved him for his "quiet dependability." (Punisher I Annual#3 (fb) - BTS) - Following the signing of the Arms Reduction Bill, Jethro Prufrock's livelihood was threatened. Turning to biological weapons, Jethro's lobbying led Progamma Biotech Lab--an upstate New York-based biotechnology company specializing in products used for genetic engineering--to develop a virus intended to overpower the central nervous system, producing powerful hallucinations; however, the product also turned people into homicidal maniacs. (Daredevil I Annual#6 (fb) - BTS) - Progamma abandoned the virus due to the mental and physical distortions it caused in their animal test subjects. (Punisher I Annual#3 (fb) - BTS / Incredible Hulk II Annual#16 (fb)) - AIM sent George and several other agents to steal the Progamma virus. George agreed to the mission, hoping to prove himself to his father, as well as gaining a major step up in the ranks. (Punisher I Annual#3) - George Prufrock broke into Progamma to steal some of their new virus. He was assaulted by a guard, whom he slew, but was exposed to some of the virus he was trying to steal. 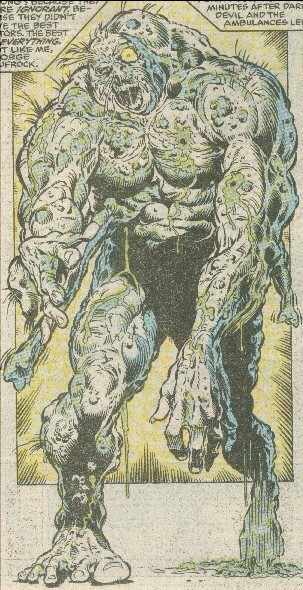 George returned to the AIM base in Sheridan (Upstate New York), where--already mutated and maddened--he encountered the Punisher who had been investigating AIM activities. 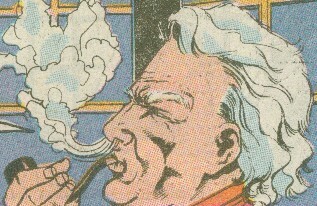 The Punisher fled after George took a hail of gunfire without harm, and he instead investigated Jethro Prufrock, having learned that he was the one who hired AIM to steal the Progamma strain. Castle confronted Jethro and Martha Prufrock, who fought back against him, but then George came crashing through the window. Rambling about his sessions with Dr. Wertham, about his headaches coming back, and about not wanting to go to banking school, George took several point blank bullets to the face, but shrugged them off and continued to assault the Punisher. Jethro cheered his son on, but this only reminded George that he hated his father, and he turned on him instead. 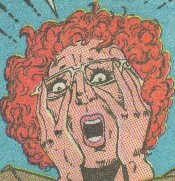 Despite the Punisher's efforts, George apparently broke his father's neck; and Martha realized the danger and fired on George with her weapon, allowing Castle to get free and take off with her. 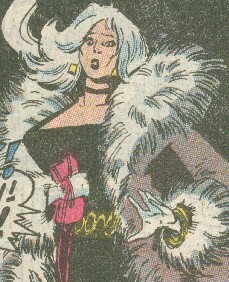 Martha brought the Punisher to her father's armory, and Castle grabbed a rocket launcher that he used against George. Taking a blast head-on, George was knocked out of the building, down the stairs, and into the water. His hand was seen grasping for air and then submerging, and Martha and Castle thought he had died. (Daredevil Annual#6) - Resurfacing in the New York harbor, the Lifeform--now carnivorous and possessing dual, dueling personalities (as well as twin hearts)--wandered the alleys, consuming any people it encountered. Daredevil heard the screams of a victim, but arrived too late to catch it. (Daredevil Annual#6/2) - Eightball, one of the kids in the "Fat Boys" skateboarding gang, heard about the Lifeform and bragged to his friends about having fought it. Challenged to prove himself by their doubts, he stole a skateboard from the older "Tunnel Teens" gang, leading them to flee down an alley and nearly be grabbed by the Lifeform which was living inside a dumpster. (Daredevil Annual#6) - Lifeform ran into the Wildboys, Jet & Spit, who attacked it ineffectively. As the Lifeform began to pummel them, Daredevil arrived to save them. Jet used his automatic weapon to shoot the Lifeform's arm off, and then the Wildboys fled, only to run into Paul Robbins, the corrupt police officer to whom they made payments. The less malevolent personality drove the Lifeform to flee before anyone else could be hurt. Robbins, curious, grabbed the fallen arm of the Lifeform, which was crumbling into dust. The remaining tissue was sent to the police laboratory by Detective Hobbes. (Daredevil Annual#6/4) - The fleeing Lifeform arrived in an alley just as Typhoid Mary killed one of the Kingpin's agents who had given out sensitive information. She sensed his presence and tried to mentally drive him off, but his dual personalities were torn between attraction to her beauty and simple hunger. At the same time, Typhoid struggled against her own Mary Walker persona, and Typhoid and the Lifeform were soon battling fiercely. Ultimately, the innocent Mary persona reached the less malevolent Prufrock persona within the Lifeform, convincing it to leave her behind and seek other sources of food. 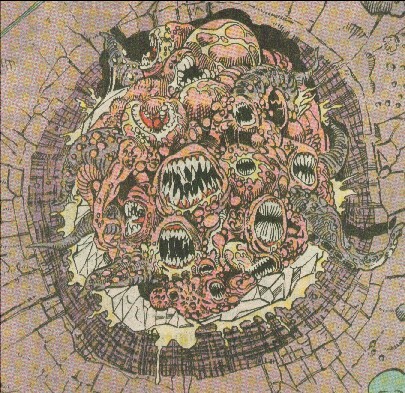 (Daredevil Annual#6/3 - BTS) - Robbins was mutated by the Lifeform virus and ultimately killed by it. (Daredevil Annual#6) - Allison analyzed the Lifeform material and found it to be constantly mutating without a catalyst. She further identified it as a mutated strain of an undetermined virus. (Daredevil Annual#6) - Later, the Lifeform cornered a pair of youths, but Daredevil arrived, allowing them to escape. The Lifeform attacked Daredevil again, and Daredevil tried in vain to convince Prufrock to return to Progamma to search for a cure, but the fight was soon broken up by the arrival of Det. Hobbes, as well as Lamar . Lamar emptied his tranquilizer gun into the Lifeform, which served to actually hasten his heart rate to the point that Daredevil thought his hearts would explode. Hobbes and his partner then opened fire on the Lifeform, which collapsed to the ground and dissolved. Lamar was infected and taken to the hospital, but the remains of Lifeform began bubbling anew after everyone had left, indicating that the threat had not ended. (Incredible Hulk II Annual#16 (fb)) - Lifeform revived and encountered the alien Mercy, who usually led others to end their suffering via death. However, a recent lesson as well as the Lifeform's dueling personae confused Mercy. Recalling her encounters with the Hulk and his opposing personae, she transported the Lifeform to a Midwest ghost town to confront the Hulk. Seeking to have both Banner and the Hulk speak to the Lifeform, Mercy then briefly merged with the Hulk, forming a duplicate of Banner, though "Banner" believed itself to be the real thing, and neither was sure of which was which. Nonetheless, the four personas debated for a time, with "Banner" arguing to save the Lifeform, the Hulk wishing to destroy it, Prufrock's benevolent side begging for death, and the malevolent Lifeform persona attempting to kill and eat everyone, growing larger and more powerful as time passed. The Lifeform eventually slew "Banner," who later revealed herself to be Mercy and revived unharmed. Before he knew this, however, the enraged Hulk through the Lifeform into a fire, which appeared to consume him. (Incredible Hulk II Annual#16 (fb) - BTS) - As Lifeform reformed anew, Mercy transported him back to New York. He begged her to kill him, but she refused. She used her powers to restore his humanity. 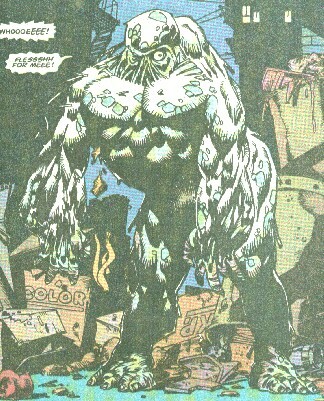 (Incredible Hulk II Annual#16) - Prufrock told his story to Kwiat in the Bellvue hospital, progressively mutating back into the Lifeform and devouring security guards and anyone else who disturbed them. As Lifeform felt his mind slipping away, he tried to perform one last act of mercy, devouring the agonized and mutating Kwiat. (Silver Surfer III Annual#3) - Losing control of himself, Lifeform finished off Kwiat and then ate a doctor and everyone else in the hospital it encountered, growing into a monstrous composite form. SHIELD (Strategic Hazard Intervention Espionage Logistics Directorate) had been monitoring Kwiat and, when they lost contact with the hospital, Fury passed the information on to Reed Richards. Reed acquired the aid of the Silver Surfer, who had traveled to Earth to inform its heroes of the seeming death of Thanos. Reed and the Surfer tracked the Lifeform to the East River, where it devoured large amounts of marine life, growing larger yet. It came to the surface suddenly, attacking the two heroes. Reed was quickly taken out of action, and as the Surfer fought the Lifeform, he soon realized that the amount of power needed to destroy the creature would cause the deaths of thousands of innocents. The Surfer allowed the Lifeform to engulf him, and then he flew it into the air, past Earth's atmosphere, into space and eventually to a planet Galactus had devoured long before. The Surfer then summoned the energy to destroy the Lifeform, but when Prufrock's mind re-surfaced and he begged the Surfer to destroy him, the Surfer decided that he could not take an "innocent" person's life. Realizing there was no way he could separate George from the monstrous Lifeform, the Surfer instead left the monstrous creature behind on the uninhabited planet, where it screamed at its plight. and Jim Starlin, Ron Marz, Rom Lim, and Tom Christopher (Silver Surfer III Annual#3). It's Progamma in Punisher Annual#3 and Programma at least once in Hulk Annual#16. Take your pick. Way to go Surfer! Leave the immensely powerful, murderous creature where it can be found and utilized by some other interstellar criminal. Prufrock's Psychologist (or is it Psychiatrist, I always confuse the professions) was most likely based on Dr. Frederic Wertham, who is famous for his campaigns against the glorification of violence and sexuality in comic books, and who wrote the book "Seduction of the Innocent" on the subject. A worker in the police laboratory, she analyzed a sample of Lifeform brought in by Det. Hobbes and found it to be constantly mutating without a catalyst. She further identified it as a mutated strain of an undetermined virus. When Hobbes asked her about her findings, she told him the info was classified, but he then threatened to reveal information about her "personal...habits," so she told him what she had found. Based on her comment that the discovery of this new form of life could be good for her career, I'd ASSume that she is a doctor. I don't know whether she had had an affair with Hobbes in the past or if there were other secrets Hobbes was threatening to expose. A member of the New York Police Department, he was the partner of Det. Paul Robbins for 11 years, and during the last 6 years he and Robbins had been acting as racketeers. He accompanied Robbins to confront the Wildboys, and he observed the fleeing Lifeform. He brought the sample of Lifeform in to Allison in the police lab. He went to Joe's Bar to harass the bartender for their protection money, but then had to take Robbins to the hospital as he began to mutate from the viral exposure. He used his knowledge of Allison's personal habits (and threats to expose them) to force her to reveal her findings. He and his new partner arrived after Daredevil had confronted Lifeform. After Lamar Kwiat failed to stop it with a tranquilizer gun (though he did nearly drive its hearts to explode), Hobbes and his partner emptied their revolvers into it, seemingly killing it. A former scientist at Progamma, he had been involved with the animal testing of the virus. After Prufrock assaulted the laboratory and stole the samples of the virus, Lamar was bitten by an escaped laboratory monkey, Subject 69-A. Now effectively Subject 69-B himself, Lamar sought to capture Prufrock to learn how to cure himself. After the Punisher's encounter with Prufrock, Lamar met with Ben Urich, sharing some of Prufrock's and the virus' history and offering to subdue the Lifeform. Urich led him to the Lifeform, and Lamar fired a number of tranquilizer darts into it, which only served to make the Lifeform's hearts race. The Lifeform grabbed him and broke his ribs, and Lamar continued to fire tranquilizer darts. It is unclear whether the creature's hearts simply gave out from the strain or whether Hobbes bullets dropped it. At any rate, Lamar was taken to the hospital, though he began having delusions about demons on the ride over. Lamar was visited by Urich, who wrote his story but effectively terminated their relationship. Lamar was then visited by George Prufrock, who was in the process of mutating back into the Lifeform. After sharing their stories, the Lifeform devoured Lamar, ending his suffering. The father of George (Lifeform) and Martha, he was a perennial right-wing Libertarian candidate for President, a staunch advocate of arms-stockpiling, believing it to be the only way to prevent communist takeover. He was also an AIM agent. He had George and Martha trained by the finest tutors under his watchful eye, attempting to prepare them for lives of influence and power, like his. George and Martha were trained in all walks of life, though the chauvinistic Jethro did not allow Martha to work with his guns. He pushed George into becoming a scientist, then got him a job with AIM. Following the signing of the Arms Reduction Bill, Jethro Prufrock's livelihood was threatened. 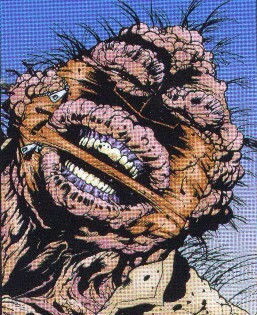 Turning to biological weapons, Jethro's lobbying led to Progamma's development of their virus, and he subsequently hired AIM to steal the virus from Progamma. He sent George on the mission as well, resulting in his mutation into Lifeform. The Punisher tracked the bioweapon theft back to Jethro and confronted him, but Jethro faked a heart attack, grabbed a gun, and began firing on Castle. George then arrived and attacked the Punisher, but when Jethro cheered him on, George instead turned on him and broke his neck. He was extremely wealthy and quite experienced with firearms and kept an immense arsenal in his house. The daughter of Jethro and the sister of George (Lifeform), Martha Prufrock was born into an extremely wealthy family with high ideals. She initially idolized her brother, and he was trained by the finest tutors under the watchful eye of her father, who attempted to prepare her and George for lives of influence and power, like his. George and Martha were trained in all walks of life, though the chauvinistic Jethro did not allow Martha to work with his guns. Later in life, Martha had little love for her brother, and she was more concerned that her father would get himself in trouble by sending his son on the mission then she was about the threat to George. 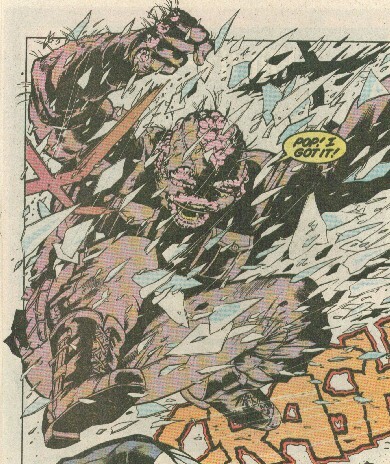 When the mutated George attacked Jethro, she fired on him repeatedly, slowing him enough to allow Castle to get free from him. She brought Castle to her father's armory where he used a rocket launcher to seemingly destroy George. Upon seeing her father dead, she vowed to continue his work. She was quite experienced with firearms, despite her father refusing to allow her to train with them. She was George's girlfriend at some point around his college and AIM careers. A member of the New York Police Department, he was the partner of Det. David Hobbes for 11 years, and during the last 6 years he and Hobbes had been acting as racketeers. Alongside Hobbes, he confronted the Wildboys over missed payments and caught a glimpse of the Lifeform. Curious, he touched the fallen arm of the Lifeform (shot off by Jet), which crumbled into dust. Later, while he and Hobbes continued to work their victims (specifically the bartender at Joe's Bar), Robbins began to mutate, with a large fleshy growth coming out of his neck. Hobbes took him to the hospital, and he rapidly degenerated into convulsions, babbling about demons from the netherworld. The material in this throat prevented him from speaking as his wife and then his mistress showed up and began arguing. While nurses and orderlies tried to restrain and treat Robbins, his heart gave out and he died. The bartender at Joe's was happy that Robbins never showed up to collect on his overdue payment. She rushed to Paul's side after he was hospitalized, arguing with Mrs. Robbins, but ultimately she could only watch Paul die.